Studies show that millennials in the States are more likely to have visited a public library than any other generation. With the birth of the tablet, it can be easier for kids to get lost in the wonderful world of cartoons as opposed to letting their imaginations run wild alongside the written word. If you are a parent who struggles to prize the tablet or smartphone out of the hands of your little one then the New York Public Library may just have the answer. Since 2005, the library has given members the opportunity to check out an e-book however now, the New York Public Library will be turning the Instagram app into an e-reader. Classic novels and short stories will be posted to its Instagram account for children and families to enjoy together. As of yesterday, all Instagram users will have access to these literary delights whether or not they have NYPL membership or live in New York City. 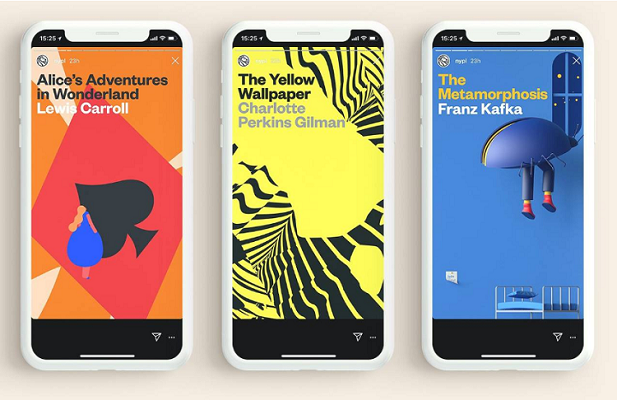 The name of this engaging initiative has been dubbed "Insta Novels" and was formulated in order to promote reading as well as the NYPL brand. The NYPL has joined forces with "Mother in New York", a creative ad agency that has donated staff resources and time to this project. It's an attempt at showing the public that libraries are too changing with the times and refuse to be forgotten at a time when technology is so central to our daily lives. “We want people to understand that libraries aren’t just those brick-and-mortar places full of dusty books,” commented NYPL’s chief branch library officer, Christopher Platt. The first, and only story available is currently Lewis Carroll's "Alice's Adventures in Wonderland" however users can expect to see Charlotte Perkins Gilman’s short story, “The Yellow Wallpaper,” and Franz Kafka’s novella, “The Metamorphosis” in the following months. Those that are familiar with Instagram will be familiar with the "story" format. When readers are on the app, the can hold the page by resting their thumb on the screen and lifting their thumb equalizes turning a page. Corinna Falusi, Mother in New York's partner and chief creative officer states that the experience is "unmistakably like reading a paperback novel". Although many have supported the initiative as a way to make reading more attractive to young people, others have commented that it will be difficult to finish stories in numerous sittings as there is no way to save your progress. What's more, Michael D. D. White, co-founder of Citizens Defending Libraries, fears that the online emphasis "diminishes the sense of place and purpose" of libraries being a physical space for shared knowledge.